Remember the cute brightening eye base I reviewed last year? 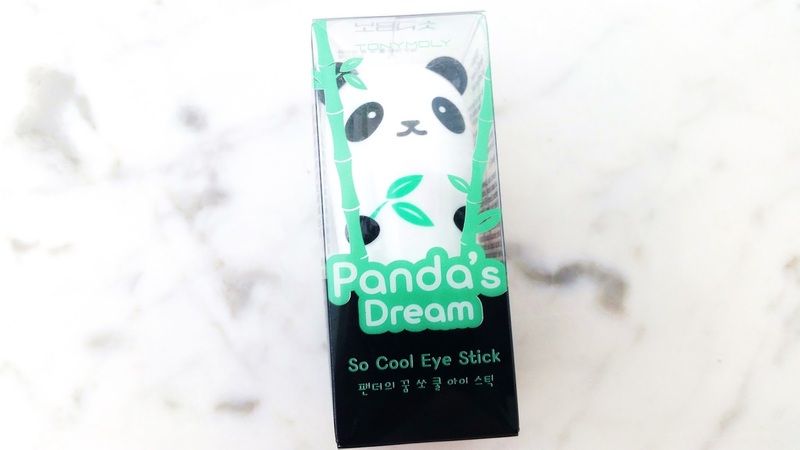 Well, here's its twin~ The equally adorable Panda's Dream So Cool Eye Stick from Tonymoly. In case you are wondering, yes, I did totally purchase this due to its adorable packaging. I'm a sucker for cute packaging and I often gets drawn towards them. Although, I've managed to talk myself out of getting some of them from time to time. Sometimes, the want just greatly outweighs the need. That was the case with this adorable eye stick, so here we are. Let's get to know it! Product Description: This Tonymoly Panda's Dream So Cool Eye Stick is the perfect fixer for tired eyes. Its cooling effect instantly 'wakes up' the area and provides the abilities to hydrate and relieve puffiness as well. 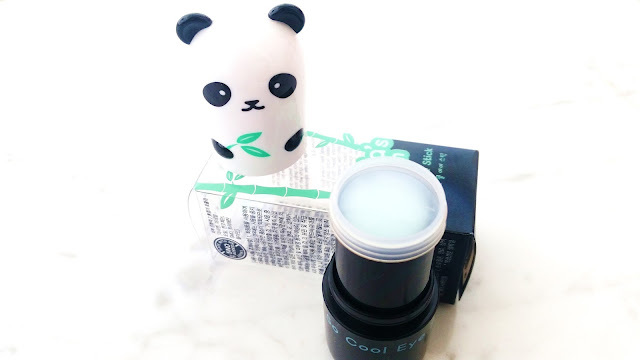 The cooling eye stick is formulated with nourishing and hydrating ingredients such as bamboo extract, glacier water, and hardy kiwi fruit extract. It even helps to minimize the appearance of fine lines and dark circles. To Use: Apply directly under the eye area in sweeping motion and re-apply whenever needed. Ingredients: Water, Butylene Glycol, Sodium Stearate, Alcohol, Xylitol, PEG-12 Dimethicone, Glycerin, PEG-8, Bis-PEG-18 Methyl Ether Dimethyl Silane, Niacinamide, Sodium Citrate, Dimethicone, Potassium Alginate, Methyl Methacrylate Crosspolymer, Xanthan Gum, Citric Acid, Actinidia Arguta Fruit Extract, Sea Water, Bambusa Vulgaris Shoot Extract, Bambusa Vulgaris Sap Extract, Glacier Water, Adenosine, Steareth-20, Caprylyl Glycol, 1,2-Hexanediol, Caprylhydroxamic Acid, Potassium Sorbate, N-Hydroxysuccinimide, Chlorhexidine Digluconate, Chrysin, Palmitoyl Oligopeptide, Palmitoyl Tetrapeptide-7, Tropolone,Fragrance,CI 42090,Phenoxyethanol. -Alcohol is an ingredient in this product as well. It's 4th on the list, so please patch test if you are sensitive to alcohol in skincare products. Although I can be sensitive to certain products with alcohol as an ingredient, I wasn't sensitive to this one. 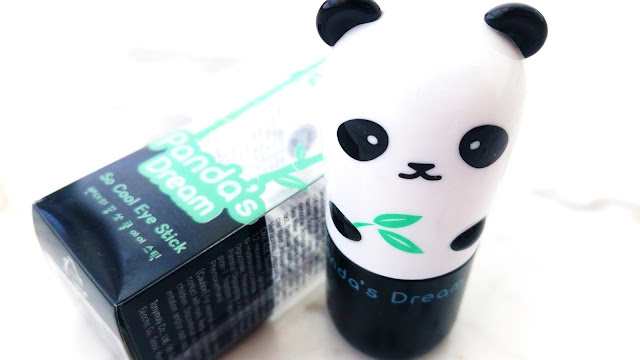 Packaging: This cool eye stick's packaging is pretty much the same as the brightening eye stick. The plastic box contains information about the products in English and Korean. 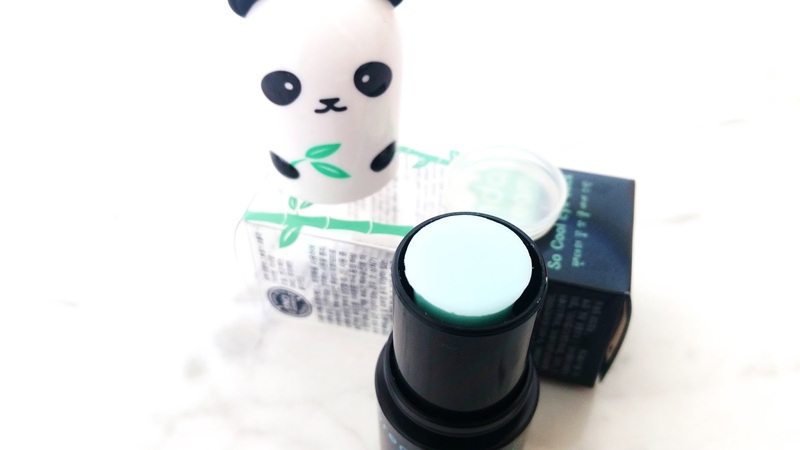 The real cutie is the eye stick itself, which has the adorable panda design. The eye stick has a pull-off lid and inside you'll find a plastic inner covering. Removing that will reveal the cool eye stick. Scent: Fragrance has been added to the eye stick and it smell like a mix of floral perfume, floral shampoo, and a hint of glue stick like scent. It's such an odd pairing. The scent is really strong in its stick form, however, it's a lot lighter when it's applied on the skin. Color: The eye stick is mint-blue! It's light mint- blue in color as you'll see in the pictures below. However, when applied, it doesn't leave behind any blue color. Texture: This cooling eye stick is super balmy in texture. It leaves the skin with a slight balmy feel but it's still lightweight at the same time. Due to its super balmy texture, not a lot of product transfers to the skin at once. Michelle's Thoughts: I was really excited when I first patch tested this product because I felt the instant cooling effect. I was iffy about it before trying it but there was a moment of cooling bliss when I applied that first swipe. However, that bliss didn't last long. It was apparent 5 minutes after application that this eye stick's effects are not long lasting. Darn it. I was getting really excited about it. Since then, I've tested it multiple times in multiple ways and the answer was always the same. Not long lasting and it doesn't fulfill all of its skincare promises either. One of the many ways I tried is layering the eye stick. I've tried as many as 16 layers (on bare skin) without it feeling heavy. It does leave a slightly noticeable balmy feeling but that feeling lightens over time. Still, even with the multiple layers applied, the cooling effect doesn't seem to last longer than 5 or 6 minutes. It's a real bummer. The Tonymoly cooling eye stick also claims to minimize the appearance of fine lines and dark circles. However, I haven't seen any noticeable changes for those promises. The eye stick does provide a slight hydration feel when applied. Although the hydrating effect last longer than its cooling effect, it still lasts no longer than an hour or 2. Plus, it's only minimal hydration, so don't expect anything amazing. Even though this product is advertised to be used any time needed, I would advise you to avoid using this when you are wearing makeup. It will move the makeup around and make it pile/look odd. Final Thoughts: I'm super disappointed in this product's skincare effects. It doesn't fulfill most of its promises and it's upsetting. Even though I did purchase this product mainly due to its adorable packaging, I still wish the actually cooling stick itself offers more than it really does. I'm going to think of ways to repurpose this adorable packaging and make it into something else. Otherwise, it'll probably forever sit on my night stand and look pretty because I won't use it. 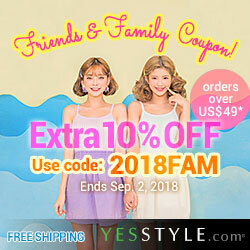 Would I repurchase it in the future? No. I think I've said enough as to why. Do I think this is worth a try? Honestly, no. I know it's a cute little panda and you probably want it too because it's a cute little panda. However, this cooling eye stick is really not worth it. Unless you really want the packaging and can find the thing on sale for less than half its price, don't do it. There are better things on the market, don't get trapped by the cuteness like I did. Although, in retrospect, if I have the opportunity to go back in time and redo this purchase, I'd probably still get it because it was on sale and my inner child really wanted this. What are your opinions on this adorable panda cooling eye stick? Let me know in the comments below!